You can display search results from the MLS based on a number of different link structures. **Note: To properly use this, you need to contact Customer Support to have us add your Agent ID & Office ID to your Account. Once that’s done, just punch in your correct Agent/Office ID on each parameter and you should be all set. You can set up a “Featured Listings” page and start driving traffic to it in no time! Like this post? Consider subscribing to the RSS feed or subscribe to The Diverse Solutions Blog by Email. @Malita: What do you mean? When a visitors fills out/submits a contact form, that lead should have been dropping into one of your Contact Groups AND you should have been receiving an email. Did that not happen in this case? @Ricardo, you’re right…it used to work just that way but all of a sudden we weren’t getting anything- so we tested it out and found out leads were going in but nothing was being reported to us. So we went round and round with support and finally just pulled the plug – they swear they can fix it so we are trying it out once again but on a subdomain this time. @Malita: Hmm… I’m not sure what the problem is (or was). If you do enable that page again, try this: http://helpdesk.diversesolutions.com/ds-agentreach/emails-not-being-delivered Whitelist the delivery emails in your address-book to make sure they’re getting delivered properly. My firm has more than one office. Is there a way to join all of our Offices’ listings on one featured listing page? What you’re essentially doing is specifying multiple values (in this case, multiple Office ID’s). To do so, you need to insert ankle brackets in between each ID number. Let me know if that works and if you have any questions I can help answer! If you don’t use the angle brackets indexing, the results page will only display results for the last value specified. Thanks Ricardo, that worked great. How would I format this to list property listed by me or my office? Of course replace the digits with the appropriate Agent and Office ID. Look for dsIDXpress tutorials and the list of link structure parameters. I’ve only had my dsIDX for 2 weeks and the results have been way beyond my wildest expectations. Traffic and time on the sight have doubled and my bounce is getting lower. I even had 2 leads captured. I’m still building out pages but I also moved from the sixth page of google to the 3rd page. I highly recommend the product. Ricardo- Need some help. 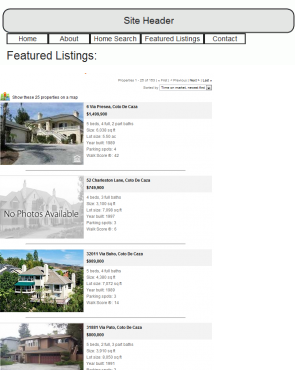 We are trying to get the listings to post directly to the website (wordpress agent theme), as opposed to the blog. Having trouble formatting the images and making sure they post to that specific area on the site. Is there specific html code to do that?